Magnadyne's "RV-LINK TV-2-WIFI" AM/FM/TV antenna is designed for manufacturer installation, but an aftermarket kit is also available. 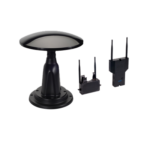 This kit includes a rooftop antenna for radio and TV as well as a long-range Wi-Fi receiver. The antenna is pre-wired to an indoor location for mounting a matched indoor Wi-Fi router. 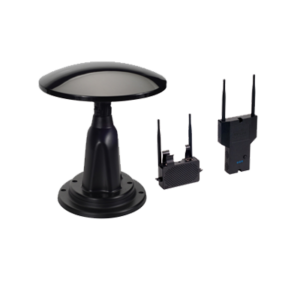 The RV-Link WF-CON Wi-Fi router upgrade kit is available for $149.95, or end users will be able to purchase the complete antenna and router package for $189.95. The router can distribute a 4G LTE connection from a smartphone, presumably by using WiFi-as-WAN. There does not appear to be a tethering capability with this system. Wi-Fi Technology / Frequencies: 2.4GHz 802.11n for WiFi as WAN, both 2.4 and 5GHz for the interior router. Other Ports: Power over Ethernet to connect the exterior and interior units. Direct from Magnadyne or pre-installed in a new RV.